It’s Elephantmen time! This week kicks off with issue #32 of Richard Starkings Elephantmen which is a Ebony centric story with a few hot comic chicks and mutants sparkled on this beautiful example of comic awesomeness. 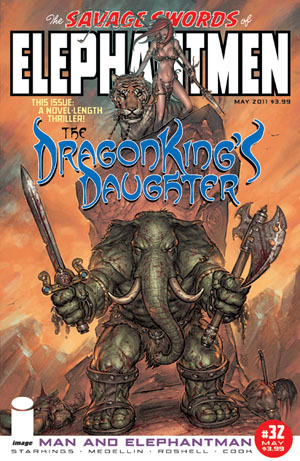 If you haven’t read Elephantmen yet you are missing out, its consistently amazing month on month. Marvel are launching Red Skull #1 which looks interesting. There are many incarnations of the Red Skull and I’m guessing this will be a nice tie-in to the Captain America movie. Indie comic wise we have Stan Lees Starborn. I haven’t been able to keep up with this title yet but it does look great and at $9.99 you can’t go wrong with the latest work of Stan Lee.